A brow lift is a procedure that lifts eyebrows that have become droopy (this is referred to as a ‘brow ptosis’). The operation may be performed on its own or, more commonly, in conjunction with an upper eyelid blepharoplasty (an upper eyelid lift or cosmetic eyelid operation). 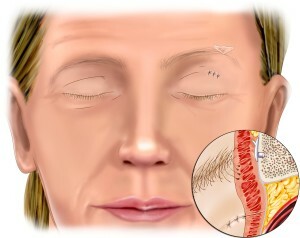 Patients often present with the complaint of “hooding” of the upper eyelids, with an inability to place make-up on the eyelids in female patients. Click here to watch a video of this patient describing her experience of undergoing an endobrow lift and upper lid blepharoplasty under ‘twilight anaesthesia’ and explaining why she would opt for this again if given the choice. Her result of the surgery is better seen in the video. Brow lift surgery may be supplemented or assisted by the use of Botox (botulinum toxin) injections and dermal fillers e.g. Restylane. Some patients also undergo fat injections to improve hollowing of the temples/cheeks/brows at the same time or at a later stage. The position of the eyebrows affects facial expression and influences how mood is judged by other people. There are a variety of eyebrow shapes. In general the female brow has a higher arch than a male’s which tends to be flatter. The brow position, particularly the tail of the brow, tends to become lower with age from the effects of both gravity and due to the effects of the muscles that draw the eyebrows down. Paradoxically, in some patients who have droopy eyelids (blepharoptosis), the brows may actually rise as a compensatory mechanism to improve the range of vision. In some patients the position of the eyebrow can be improved with the use of botulinum toxin injections alone. (This is often referred to as a “chemical brow lift”). Botulinum toxin (Botox or Azzalure) is injected into the muscles between the eyebrows that cause the frown lines and into the muscle which causes the “laughter lines” at the outer aspects of the eyelids. The injections are very quick and simple to perform. They are repeated every 3-4 months. Botox injections can also improve the outcome of surgery performed to raise the eyebrows and can help to maintain the effects for a longer period of time by preventing the action of the muscles which pull the eyebrows down (the brow depressor muscles). This allows the muscle that lifts the brows to work unimpeded. Botox injections are never given at the time of surgery or within the first few weeks after surgery as postoperative tissue swelling can cause the botulinum toxin to spread to other muscle groups. For this reason the injections are given 2-3 weeks before surgery. Once the maximal effects of the injections are seen (usually after 7-8 days) the toxin cannot migrate to affect unwanted muscles. 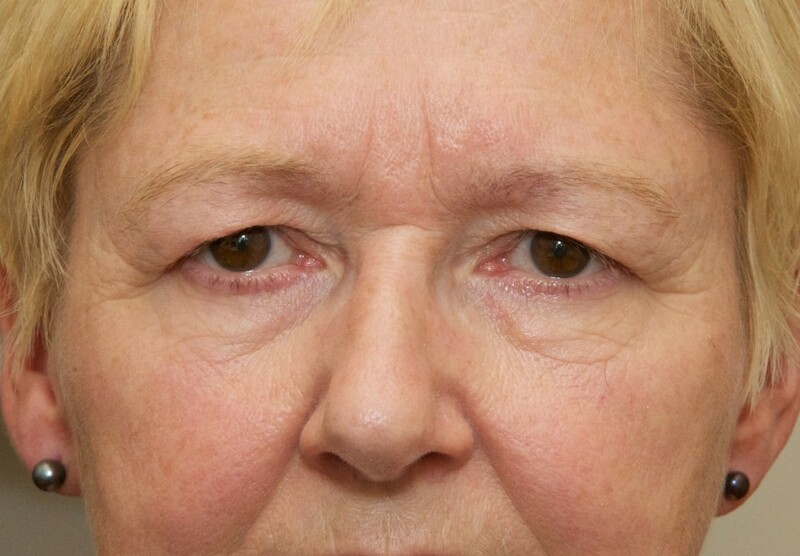 The temporal direct brow lift involves the removal of redundant tissue just above the outer aspect of the eyebrow and is mainly used in Caucasian patients over the age of 50 with a temporal brow ptosis (the outer aspect of the brow is sagging down). The scars are visible but they tend to mimic skin creases once completely healed. The procedure is quick to perform, effective and long lasting. It is generally performed under local anaesthesia, or under “twilight anaesthesia“, on a day case basis. 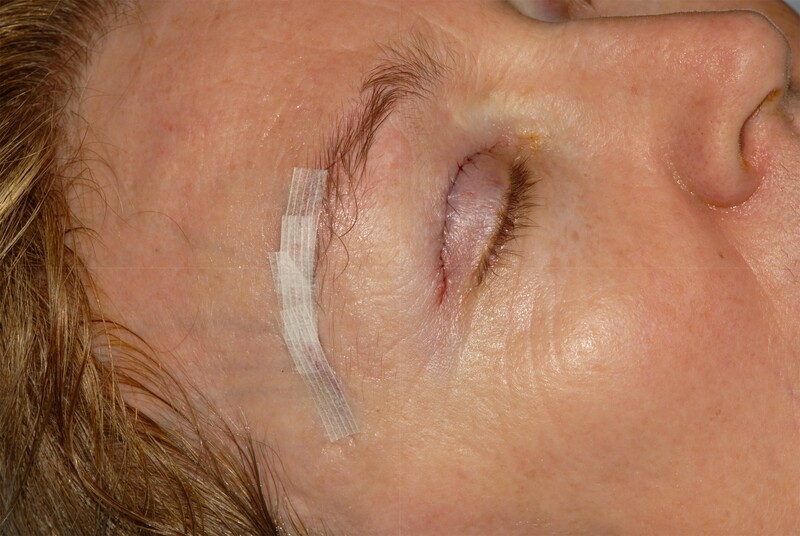 The appearance at the completion of surgery with the brow wound reinforced with the use of Steristrips. Preoperative photograph of the same patient showing hooding of the upper eyelids. 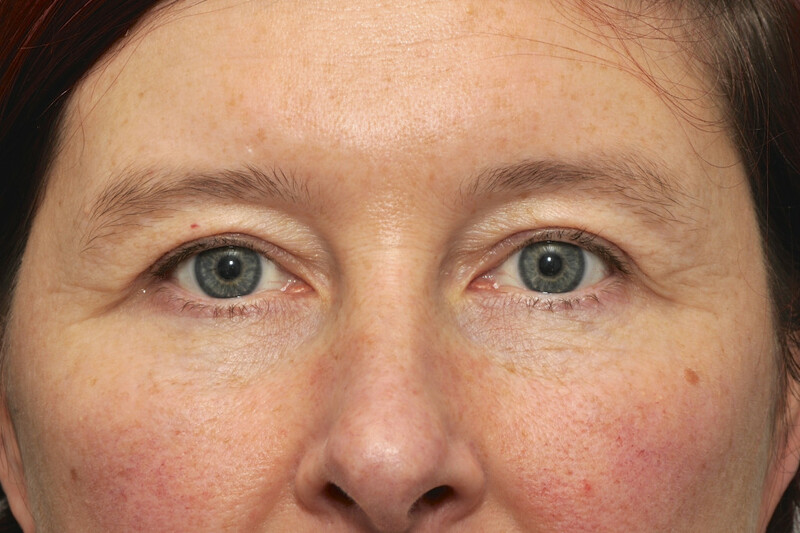 Postoperative photograph of the same patient 6 weeks following a bilateral temporal direct brow lift and an upper lid blepharoplasty. An “endoscopic” or endobrow lift is used for moderate degrees of brow ptosis, usually in conjunction with an upper lid blepharoplasty, in patients usually aged 40-55. 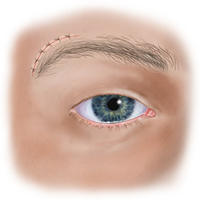 In this operation, in my practice, only 2 incisions (rather than 5) are made just behind the hairline if the surgery is combined with an upper lid blepharoplasty (see the drawing below). The delicate release of the brow tissues is undertaken via the upper lid blepharoplasty incision, under direct vision, making the use of an endoscope (surgical telescope) unnecessary. Once the forehead and brows have been released, the tissues are fixated using 2 Endotine implants in combination with Tisseel, a fibrin sealant (a tissue glue). The approach leaves small scars just behind the hairline. This procedure is generally unsuitable for patients with thinning of the hair, a very high hairline and a prominent forehead. This operation can be performed under “twilight anaesthesia” on a day case basis at my clinic Face & Eye, or under general anaesthesia in hospital. Botulinum toxin injections (Botox or Azzalure) are usually given 2-3 weeks before the operation and continued postoperatively to help to maintain the brow lift long term. 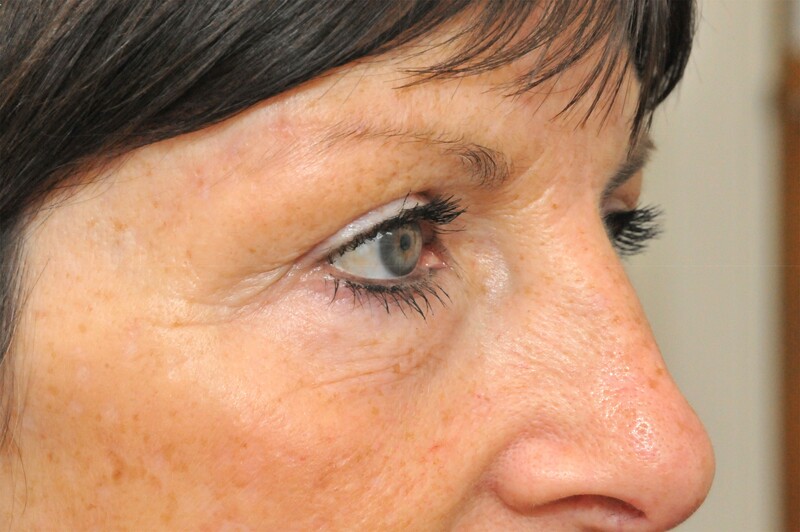 A transblepharoplasty brow fixation is performed in conjunction with an upper lid blepharoplasty. The brow is released internally from its local attachments via the upper lid blepharoplasty incision. The internal aspect of the brow is sutured (stitched) to the lining of the bone (periosteum) just above the brow with a nylon suture. The brow is not raised significantly but is stabilised and prevented from becoming droopier following the upper lid blepharoplasty. This operation is generally performed under “twilight anaesthesia” on a day case basis. In carefully selected patients the brow can be raised via the same upper lid blepharoplasty incision using a special device called an “Endotine” implant. This is a small device that has some projections which anchor the elevated brows in an elevated position until the brows heal. The device is fixed into the bone just above the eyebrow using a small partial thickness drill hole. The implant dissolves after 6-9 months. The implant can be felt until it dissolves but it is not visible. This device is very popular and effective when used for the appropriate patient. A very similar device can also be used in the region of the frontal hairline to provide fixation of the forehead in an endoscopic brow lift. Botulinum toxin injections are usually given 2-3 weeks before the operation and continued postoperatively. This operation is generally performed under “twilight anaesthesia” on a day case basis. The coronal forehead and brow lift is the most invasive approach to brow lifting. This involves an extensive incision running across the scalp a few centimetres behind the hairline. Although considered rather out-moded, this approach is still required for patients with a very severe brow ptosis who are unsuitable for alternative approaches. The disadvantages of this approach are the extensive scar and numbness of the scalp behind the scar which extends to the centre of the scalp. 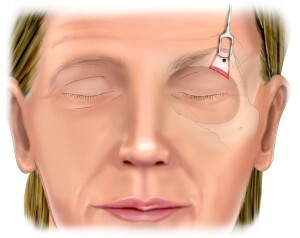 The pretrichial brow lift involves an incision running across the forehead just in front of the hairline. This approach is generally required for patients with a significant degree of brow ptosis and a high forehead who are unsuitable for alternative approaches. The disadvantages of this approach are also the extensive scar and numbness of the scalp behind the scar which extends to the centre of the scalp. 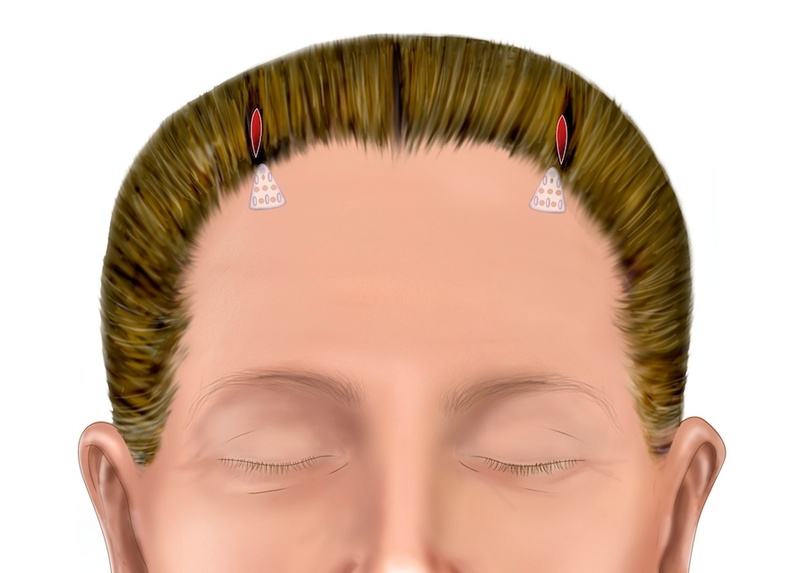 This is very similar to the pretrichial brow lift except that the skin incisions are not as extensive and are confined to the outer aspect of the forehead, just in front of the hairline. The suture brow lift using gradually dissolvable sutures is a minimally invasive brow lift procedure with a rapid recovery period. It is suitable for patients who have a moderate degree of brow ptosis who want to avoid a more prolonged recovery period. For most patients this provides a brow lift that only lasts only for 1-2 years although it can be repeated. It is undertaken under local anaesthesia or under mild “twilight” anaesthesia on a day case basis. It is very helpful if you have old photographs which you can bring along to the consultation. If you are happy to email us digital photographs of your current appearance in advance of the consultation with details of your concerns, this is also enormously helpful and saves time. Your photographs will be kept confidential and will form part of your clinical record. You will have your blood pressure checked by the nurses. You may also be required to have a physical examination of your heart and lungs by the anaesthetist to make sure it is safe for you to have a general anaesthetic if this is required in your case. You may need to have some routine laboratory tests, such as urinalysis (tests of your urine), a chest x-ray, or a blood cell count. These should reveal potential problems that might complicate the surgery if not detected and treated early. No testing is usually necessary, however, if you are in good health and younger than age 55. The nurses are also happy to answer any further questions and to show you the facilities at Face & Eye, including the operating theatre if it is not in use. They can also advise you about additional non-surgical treatments and long term skin care which may enhance and help to maintain the results of surgery. If you have any specific skin problems, we may refer you to our clinic dermatologist for help and advice. Please answer all questions completely and honestly as they are asked only for your own wellbeing, so that your cosmetic surgery can be planned as carefully as possible. The information is treated confidentially. If you are unsure of the names of any medications, bring them with you. You will be told whether or not to stop any medications at this preoperative clinic visit. For example, if you are taking aspirin-containing medicines or anticoagulants, they may need to be temporarily withdrawn or reduced in dose for two weeks before the procedure as long as these are not medically essential. You might need to check this with your GP. Any anti-inflammatory medicines e.g. Ibuprofen, Nurofen must be discontinued at least 2 weeks before surgery. These medicines predispose you to excessive bleeding. You will be given a leaflet advising you on what medications, foods, and vitamin supplements to avoid prior to surgery. Your blood pressure should also be under good control if you take medications for hypertension. This is very important. If you can, try to stop smoking at least six to eight weeks prior to surgery. Smoking has an adverse effect on healing and damages your eyelid skin and supporting tissues and your eyes (it can result in premature cataract formation and age related macular degeneration with a loss of central vision). Your vision in each eye is measured. 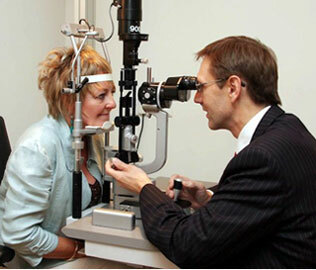 Your eyes are examined carefully using a slit lamp (a special ophthalmic microscope). Your tear film status is determined and the back of the eyes (called the retina) are examined as well as the eyelids themselves. The rest of your face is then examined. The general state of your skin is assessed and photographs of your face and eyelids are taken before surgery so that the results of surgery can be compared with the original appearance. The photographs are confidential and can only be used for any purpose other than your own records with your specific written permission. All our patients are provided with a detailed report following a consultation. This summarises the consultation, the recommendations and also the preoperative and postoperative requirements. We much prefer that our patients return to see us in clinic before proceeding with their surgery so that we can have the opportunity to answer any queries and so that a consent form for surgery is completed in advance and not on the day of surgery. If a patient is travelling a long distance however, this second consultation can be omitted and instead queries can be addressed by email and a copy of the consent form sent in advance so that this can be checked by you. What are the possible complications of brow lift surgery? Complications in the hands of a trained and experienced oculoplastic surgeon are very rare and all precautions are taken to minimize any risks. Most complications of eyelid and brow surgery are amenable to successful treatment. Blurred or double vision, lasting mainly for a few hours, and sometimes up to a day or two after surgery. This may occur for several reasons – ointment put in the eyes immediately after the operation, local anaesthetic used in the operation, swelling of the muscles that control eye movement or swelling of the normally clear covering around the eye (the conjunctiva). If blurring persists for longer than 48 hours, it is important to inform your surgeon. Watery eyes – this is quite common for the first few days after the operation due to some irritation of the eyes and a temporary weakness of reflex blinking of the eyelids. Dry eyes may persist for two to three weeks or sometimes longer. You will need to lubricate your eyes every 1-2 hours using artificial tears during the day (e.g. Hyabak drops, Hylotears, Viscotears, Systane drops) and an ointment at night (Lacrilube). These should be prescribed for you. You will gradually reduce the frequency until you can dispense with them altogether. It is very rare for patients to have to continue with them long-term but this is possible. This is why it is important to exclude a dry eye problem before proceeding with this type of surgery. Injury to the surface of the eyeball (a corneal abrasion) that causes persistent pain. If the pain lasts longer than a few hours after the operation, the surgeon must be informed. Such a problem is extremely rare in the hands of an oculoplastic surgeon. Such a problem is treated with antibiotic ointment. Sometimes a bandage contact lens needs to be used. Bleeding. A collection of blood around the eyelids or behind the eyeball, is called a haematoma. A sudden haematoma behind the eyeball can cause loss of eyesight if not managed appropriately and without delay. This is the most serious potential complication of this surgery but is extremely rare. An oculoplastic surgeon is trained to prevent and to manage such a problem. A haematoma usually needs to be drained in the operating theatre. A blepharoptosis (the upper eyelid does not open because of stretching of the muscle or tendon that controls it). Another operation may be necessary to repair this. 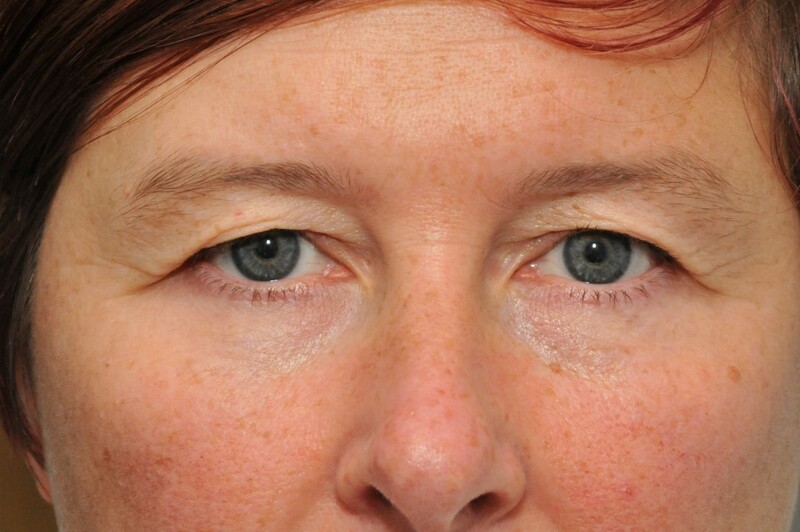 An oculoplastic surgeon undertakes ptosis surgery routinely. Exposure of the cornea, the clear sensitive surface of the eye. When blinking the eyelids do not cover the eyeball completely. This often occurs for a short time after the operation and is treated routinely with artificial tear drops. If too much skin is removed from the upper eyelids, the eyelid closure can be compromised long term. This may require further surgery to correct it. For this reason, great care is taken to mark the skin to be removed before surgery is commenced. Such a problem is very unusual in the hands of an oculoplastic surgeon. Acute glaucoma – this is raised pressure within the eye, which results in pain in the eye, haloes around lights or severe blurring of vision, a headache above the eye, and vomiting. A patient at risk of such a postoperative problem would be identified by an oculoplastic surgeon. An oculoplastic surgeon is trained to diagnose and treat such a problem. Infection. An infection following this surgery is extremely rare but it is important to follow postoperative wound care instructions to help to prevent such a problem. These should be given to you in writing for you to take home following surgery. Lower eyelid ectropion. This is a malposition of the lower eyelid where the eyelid hangs away from the eyeball. This is a risk in patients who have a very loose lower eyelid preoperatively. 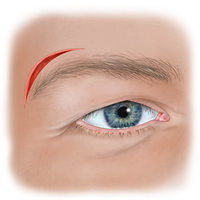 Precautions are taken to prevent this in at risk patients with the use of an eyelid tightening procedure. An ectropion is a common age related problem which is routinely corrected by oculoplastic surgeons. Asymmetry. It is impossible for any surgeon to achieve perfect symmetry although an oculoplastic surgeon strives to achieve this. A cosmetically unacceptable asymmetry e.g. 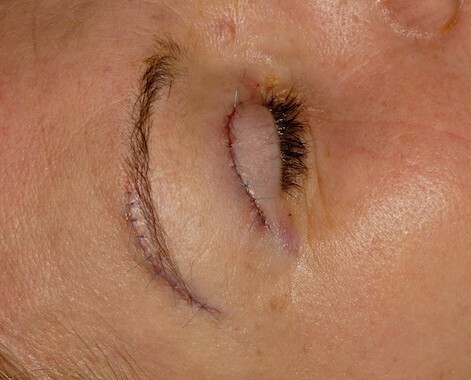 of the upper lid skin crease, fullness of the eyelids, lower lid position is always possible and further surgery may be required to address this. Scarring. Most eyelid wounds heal with scars that are barely perceptible although full maturation of the wounds can take some months. Poor scarring can follow infection or wound disruption but this is very rare. Poor scars can be treated with steroid injections or with the application of silicone gels e.g. Kelocote. Rarely, scars need to be revised surgically. Eyelid lumps. Lumps can very occasionally occur as a reaction to sutures used to close the wounds. These usually resolve with time but occasionally steroid injections are required. Rarely, lumpiness can occur in fat that is repositioned over the inferior orbital margin. This usually responds to postoperative massage. Numbness in the forehead. This is due to bruising of the sensory nerves to the forehead. This is usually temporary but it may take some months for normal sensation to recover. Hair loss. This can occasionally occur around the incisions in the case of an endoscopic brow lift which is why this procedure is not well suited to those with hair thinning. 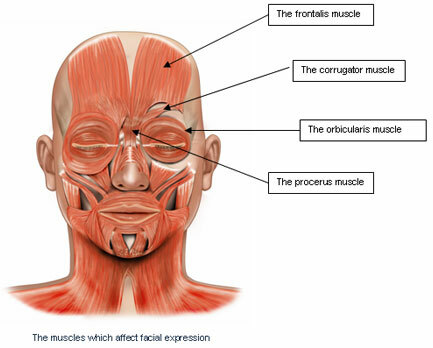 Frontalis palsy. A paralysis of the upward movement of the eyebrows can occur due to damage to the nerve supply to the frontalis muscle. A palsy (weakness) immediately following surgery may occur due to a “neuropraxia” (blunt injury to the nerve caused by intraoperative manipulation of the tissues). This usually resolves in a few weeks. A permanent paralysis is extremely rare. Reoperation. Further surgery within the first few weeks to address any asymmetries may be required. This should be borne in mind. There are a number of factors beyond a surgeon’s control, which can have an impact on postoperative progress e.g. postoperative swelling affecting one side more than the other, which in turn can necessitate re-intervention. What happens after brow lift surgery? 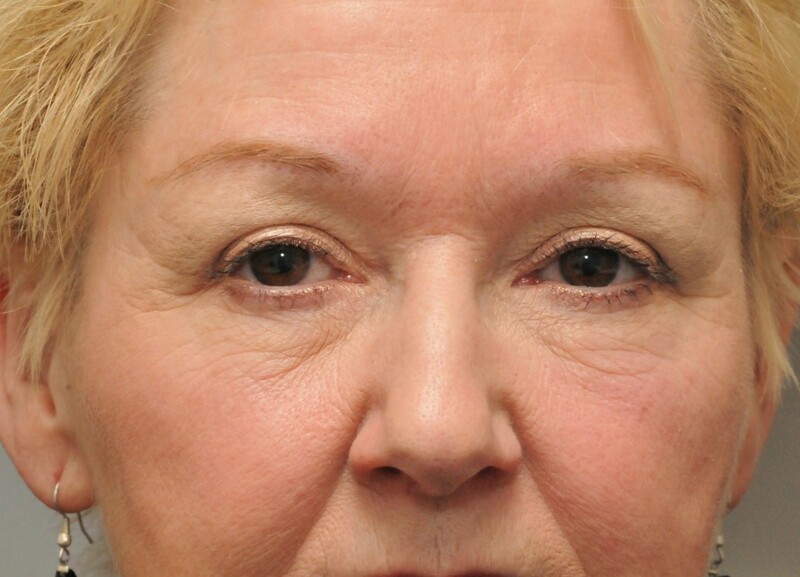 After brow lift surgery, the eyes are initially covered with pressure dressings for approximately half an hour to reduce postoperative swelling and the wounds are treated with antibiotic ointment. The dressings are then removed and replaced with cool packs. A forehead/scalp dressing with a bandage may be left in place overnight. Activity is restricted for 2 weeks to prevent bleeding. You will be asked to clean the eyelids and any scalp or brow wounds very gently using clean cotton wool and Normasol (sterile saline) or cooled boiled water and repeat the application of antibiotic ointment (usually Chloramphenicol or Soframycin) to the wounds 3 times a day for 2 weeks. The sutures used are dissolvable but are usually removed in clinic after 2 weeks. The skin around the eyes should be protected from direct sunlight, by avoidance if possible or by using protective sunglasses. Wearing make-up should be avoided for at least 2 weeks. After 2 weeks the use of mineral make-up is recommended. (The aesthetics nurses at the clinic Face & Eye can demonstrate this to you). It is important to devote a lot of time to your aftercare for the first 2 weeks and some patients find this somewhat labour intensive. A realistic period of recovery must be expected. Postoperative bruising usually takes at least 2-3 weeks to subside completely. Swelling takes much longer. Most of the swelling disappears after 3-4 weeks but this can vary considerably from patient to patient as does the extent of the swelling. The final result is not seen for at least 3-4 months. This should be taken into consideration when scheduling the operation. You should arrange this surgery after holiday periods or important professional or social events and not before so that you are available for postoperative review and just in case any surgical adjustments are required. You should be aware that swelling and bruising can sometimes create quite an initial psychological impact for some people and you should prepare yourself and your relatives for this. The upper lid scars gradually fade to fine white marks within a few months. Those in the upper eyelid are hidden within the skin crease unless an additional skin incision is required to remove a “dog-ear” of excess skin just below the tail of the eyebrow. You will need to use frequent artificial tears for the first 2-3 weeks following surgery. It is preferable to use preservative free drops. These will be prescribed for you e.g. Hyabak drops, Systane eye drops preservative free, Viscotears preservative free, Liquifilm tears preservative free, or Celluvisc drops and Lacrilube ointment at bedtime. It is often recommended that you use Lacrilube ointment to the eyes 2 hourly for the first 48 hours after surgery following any upper lid surgery but note that this will cause blurring of vision. (You should not drive for the first few days after surgery). These medications can be purchased from my clinic Face & Eye or online from the clinic’s online shop (www.faceandeyeshop.co.uk). You should not pull the lower eyelid down to put these drops or ointments in the eyes following lower eyelid surgery. You are advised to sleep with the head raised approximately 30 degrees. It is preferable to raise the head of the bed if possible. Contact lenses should not be worn for a few weeks following this type of surgery. (Please note that, while many of my patients have very kindly consented to the use of their photographs for this website, others prefer that their photographs are only shown in my portfolio in my clinic Face & Eye. These can be viewed at the clinic. Many other patients do not wish their photographs to be used for any purpose other than their own records and their confidentiality is respected). Conscious sedation, also known as “twilight anaesthesia”, is a type of anaesthesia which is preferred by many patients for most of our surgical procedures. It is a very comfortable and gentle type of anaesthesia which is far less invasive than the typical general anaesthesia but at the same time highly effective. It is also of advantage for very nervous or anxious patients undergoing quite minor procedures. Typically patients sleep most of the way through their procedure and have no or very little recollection of it at all. You are looked after throughout the procedure by a specialist consultant anaesthetist who has many years of experience of this type of anaesthesia, so that your surgeon can concentrate fully on your operation. Shortly before moving to the operating room, a small tube (cannula) is placed into a vein in the back of your hand by the consultant anaesthetist and the anaesthetic drugs are given through that. These are Midazolam (a short acting type of Valium) and Propofol, a drug which is also used for general anaesthesia but, for conscious sedation, much lower doses are used. With conscious sedation there is no breathing tube or breathing machine, just a gentle flow of oxygen given through a plastic tube within a soft sponge protector inserted into one of your nostrils. Once the sedation has been commenced a local anaesthetic solution (a mixture of Marcaine and Lignocaine) is injected into the operative area to ensure a painless procedure. Typical side effects of general anaesthesia including a sore throat and nausea are avoided. Waking up takes only a few minutes at the completion of the surgery and is usually free of any “grogginess.” This type of anaesthesia has been used safely and successfully for our surgical procedures for over 20 years. Below is a video of a patient describing her experience of “twilight anaesthesia and explaining why she would opt for this again if given the choice. 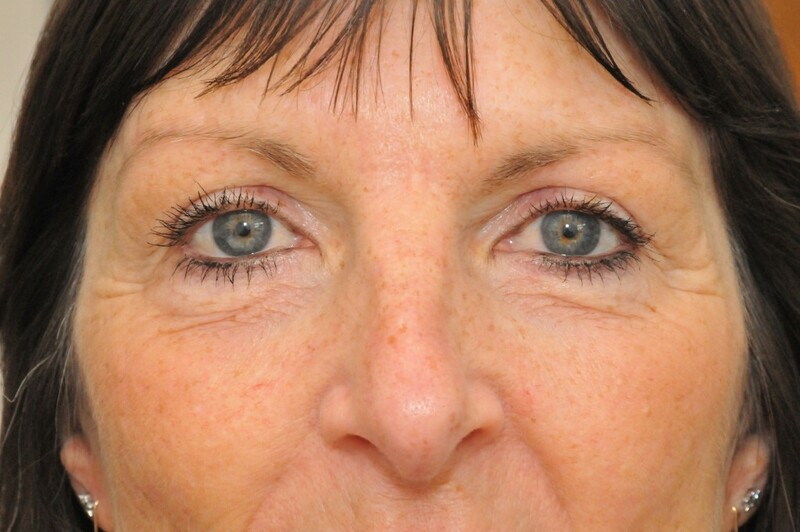 She underwent a bilateral upper lid blepharoplasty and an endobrow lift at the clinic. Click here to watch a video of a patient describing her experience of “twilight anaesthesia and explaining why she would opt for this again if given the choice. 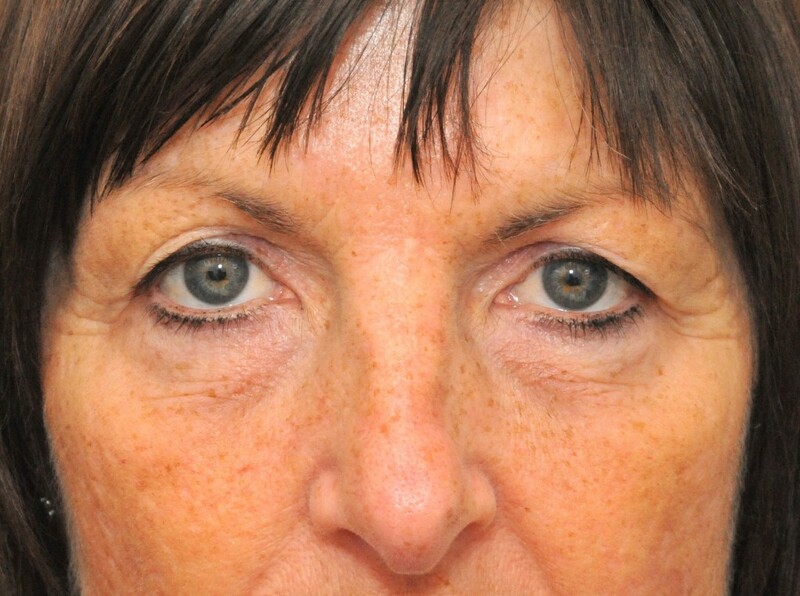 She underwent a bilateral upper lid blepharoplasty and an endobrow lift at the clinic. To learn more about Brow Lift, please contact us at today to schedule an appointment. Please include non-confidential medical questions and correspondence only.